September is a busy time of the year for people in Melbourne. The AFL finals are in full swing and the weather is starting to turn for the better, ensuring that the CBD is bustling on a regular basis. This should mean that it’s a real pain in the neck to get a park anywhere in the city. However, thanks to Australian Bollards, this isn’t an issue at Etihad Stadium, where our E-DS units are simplifying the process for drivers. The devices feature 32 inch or 42 inch display screens and are equipped with a Parking Guidance and Information System (PGI) is another impressive function which can direct drivers to vacant car spaces by monitoring traffic, therefore reducing the hassle and amount of time spent on trying to navigate a free park. The E-DS’ also feature a Variable Message System (VMS) capabilities, which provides the ability to harness content and transmit it in a compelling manner, whether that it is a static format or a more interactive way. This might be in the form of hourly prices, brand advertising, transaction instructions or messages thanking the road user for accessing the car park. 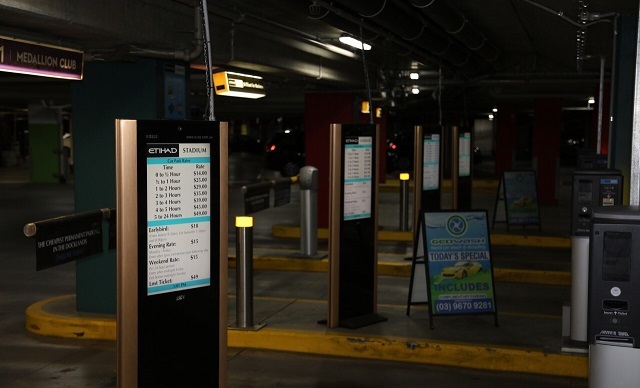 Already situated at iconic locations Crown Casino and Melbourne Convention and Exhibition Centre, E-DS from Australian Bollards is changing parking for the better at Etihad Stadium.